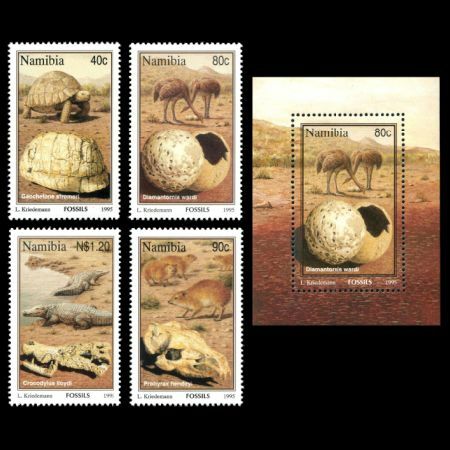 In May 1995 Post Authority of Namibia issued a set of four stamps and a block depicted some fossil of prehistoric animals and some modern animals of the country. 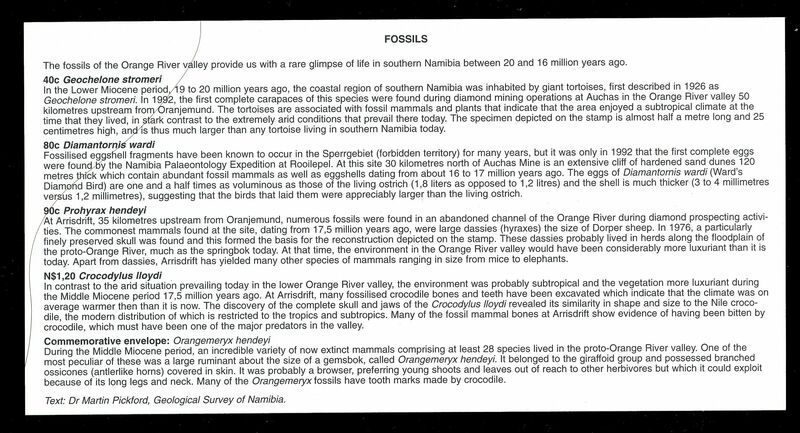 All this fossils are found at Orange River. (Orange River is the longest river in South Africa. It rises in the Drakensberg mountains in Lesotho, flowing westwards through South Africa to the Atlantic Ocean. The river forms part of the international borders between South Africa and Namibia and between South Africa and Lesotho, as well as several provincial borders within South Africa. Except for Upington, Kimberly, and Aggeneys, the river does not pass through any major cities, it plays an important role in the South African economy by providing water for irrigation, as well as hydroelectric power. The river was named by Robert Jacob Gordon after the Dutch Royal House.) 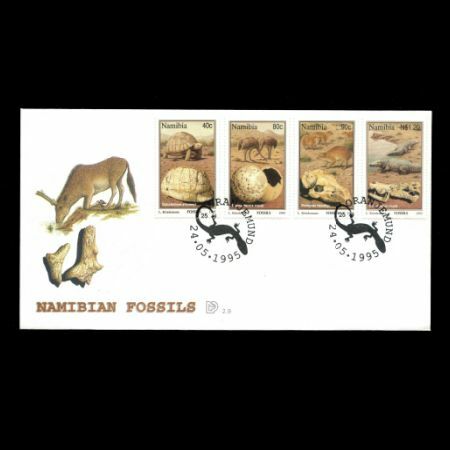 The fossils of the Orange River vlley provide us with a rare glimpse of life in southern Namibia between 20 and 16 million years ago. time that they lived, in stark contrast to the extremely arid conditions that prevail there today. 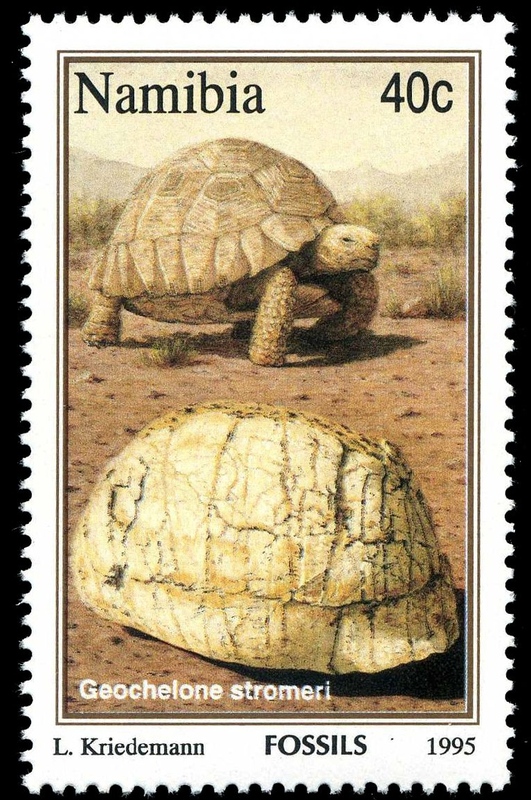 The specimen depicted on the stamp is almost half a metre long and 25 centimetres high, an is thus much larger than any tortoise living in southern Namibia today. Diamod Bird) are one and a half times as voluminous as those of the living ostrich (1,8 liters as opposed to 1,2 litres) and the shell is much thicker (3 to 4 millimetres verus 1,2 millimetres), suggesting that the birds that laid them were appreciably larger than the living ostrich. At Arrisdrift, 35 kilometres upstream from Oranjemund, numerous fossils were found in an abandoned channel of the Orange River during diamond prospecting activities. 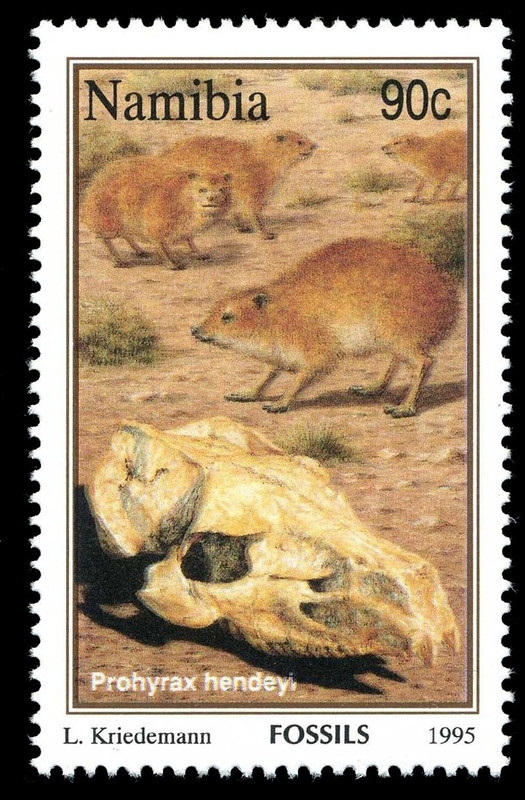 The commonest mammals found at the site, dating from 17,5 million years ago, were large dassies (hyraxes) the size of Dorper sheep. In 1976, a particularly finely preserved skull was found and this formed the basis for the reconstruction depicted on the stamp. 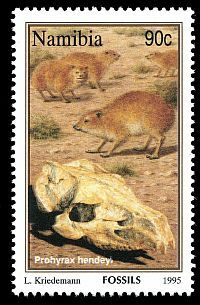 These dassies probably lived in herds along the floodplain of the proto-Orange River, much as the springbok today. At that time, the environment in the Orange River valley would have been considerably more luxuriant than it is today. Apart from dassies, Arrisdrift has yielded many other species of mammals ranging in size from mice to elephants. In contrast to the arid situation prevailing today in the lower Orange River valley, the environment was probably subtropical and the vegetation more luxuriant during the Middle Miocene period 17,5 million years ago. 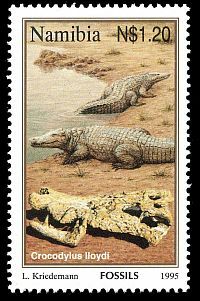 At Arrisdrift, many fossilised crocodile bones and teeth have been excavated which indicate that the climate was on average warmer then than it is now. The discovery of the complete skull and jaws of the Crocodylus I/oydi revealed its similarity in shape and size to the Nile crocodile, the modern distribution of which is restricted to the tropics and subtropics. Many of the fossil mammal bones at Arrisdrift show evidence of having been bitten by crocodile, which must have been one of the major predators in the valley. 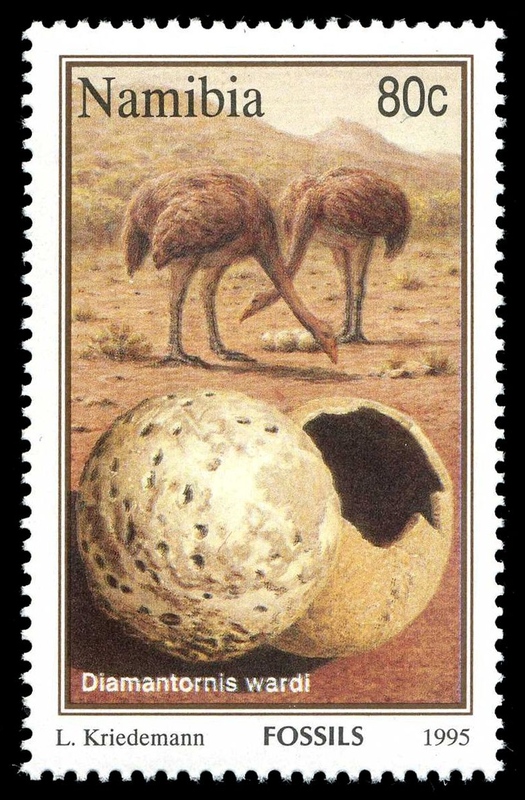 During the Middle Miocene period, an incredible variety of now extinct mammals comprising at least 28 species lived in the proto-Orange River valley. One of the most peculiar of these was a large ruminant about the size of a gemsbok, called Orangemeryx hendeyi. It belonged to the giraffoid group and possessed branched ossicones (antlerlike horns) covered in skin. It was probably a browser, preferring young shoots and leaves out of reach to other herbivores but which it could exploit because of its long legs and neck. Many of the Orangemeryx fossils have tooth marks made by crocodile.